The Planet Bike SuperFlash Micro USB Tail Light is a tiny red light that is quite bright. It comes with hardware that allows it to be mounted to a bike seatpost or seatstay and a clip for mounting it to a bag or clothing. I used several zipties in combination with the clothing clip to attach the light to the back of my helmet. The light's packaging makes wildly optimistic claims about runtime. Like pretty much every LED "blinky" on the planet, this light can be set run in either flash or steady modes. Some folks find flashing lights very annoying and various randonneuring events and some European countries require lights be run in solid modes. I tend to favor the steady mode of light myself, so I figured I'd test the runtime to see how long a charge really lasts with the light set to solid. When blinking, the light is effectively off about half the time so naturally the light burns longer since the battery gets to rest between each light pulse. The package claims a 2 to 4 hour charge should give 36 hours of runtime. Experience has taught me that such claims are inflated and I figured they were basing this on flashing times, so I ran a couple of tests on the light. The charge times were accurate. I plugged in the Mini USB cable and charged the light. I ran the test a couple of times, charging the light fully until the blue LED stopped flashing and burned solid. I then let the light run in solid mode up until the battery depleted to the point it switched to the flashing low battery warning flash mode. In both my trials, the results were the same. The charge time was about 2.5 hours. The solid burn time was nowhere near 36 hours. After 7.5 hours, the light switched to the flashing mode. 55 minutes later, the light would go out. Obviously, this is far short of the claimed runtime. On the plus side, the light is well made and seems nicely weatherproof. It retained full brightness for the 7.5 hours and the low battery warning flash is still plenty bright to get most commuting cyclists home on a dark night. 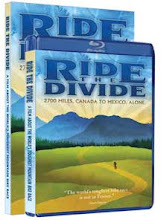 Since I never believed the 36 hour claim, I'm not too disappointed in the short runtime. For my purposes, as a helmet light, I appreciate the light weight and with my current, brief commute I won't have to charge the light all that frequently. But randonneurs or others looking for a light that can reliably shine steadily through long dark nights should look for something larger with more proven battery life. With the exception of a few tie-dyed Grateful Dead t-shirts, most of my wardrobe is in shades of black or grey. While the darker colors do a fine job concealing bike grease stains (a primary consideration when I select an item of clothing), my Neo-in-the-Matrix wardrobe also tends to make me nearly invisible at night. While this might be a favorable outcome if I was a trained assassin intent on avoiding detection, my goals usually tend towards the preservation rather than the termination of life. And since one of the lives I'm rather intent on preserving is the one I'm currently living, I find it wise and prudent to add a bit of reflective gear to my wardrobe when I'm out afoot or awheel in the hours of darkness. 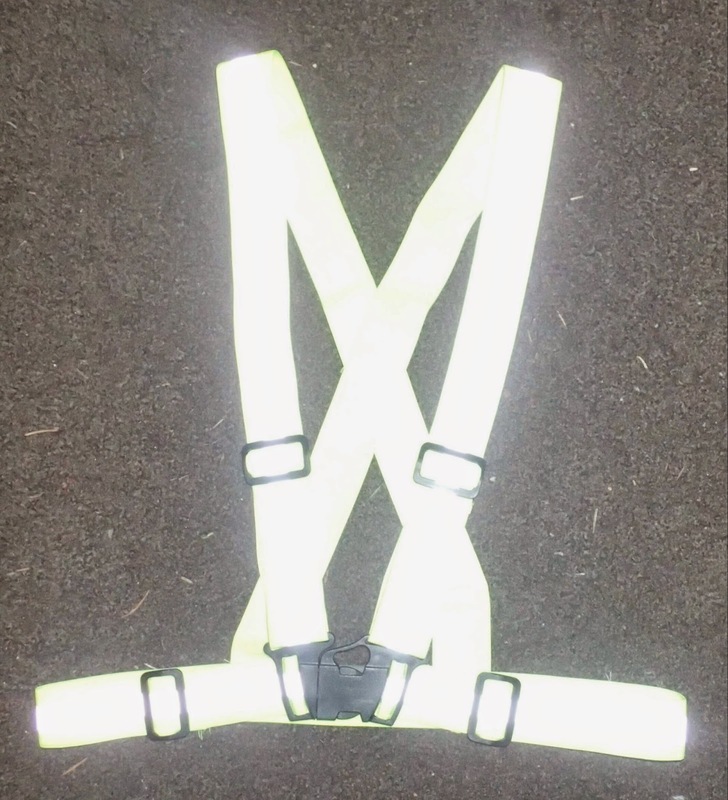 The Tuvizio Reflective Vest is a light, simple, highly reflective vest. 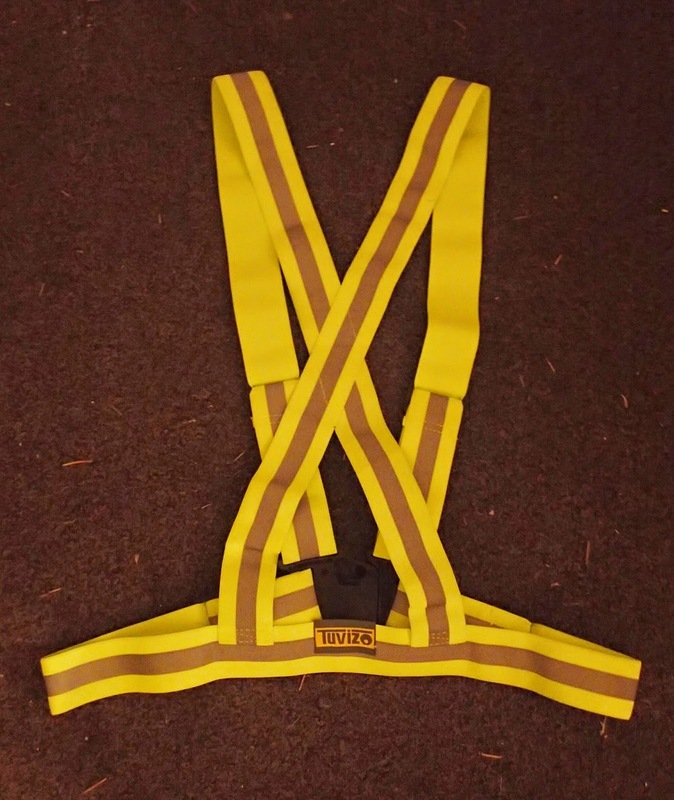 It's made from a stretchy material arranged in basically a belt plus suspenders configuration. Nylon sliders let you adjust the length of both the belt and suspenders and a single belly buckle make it easy to take the vest on and off. 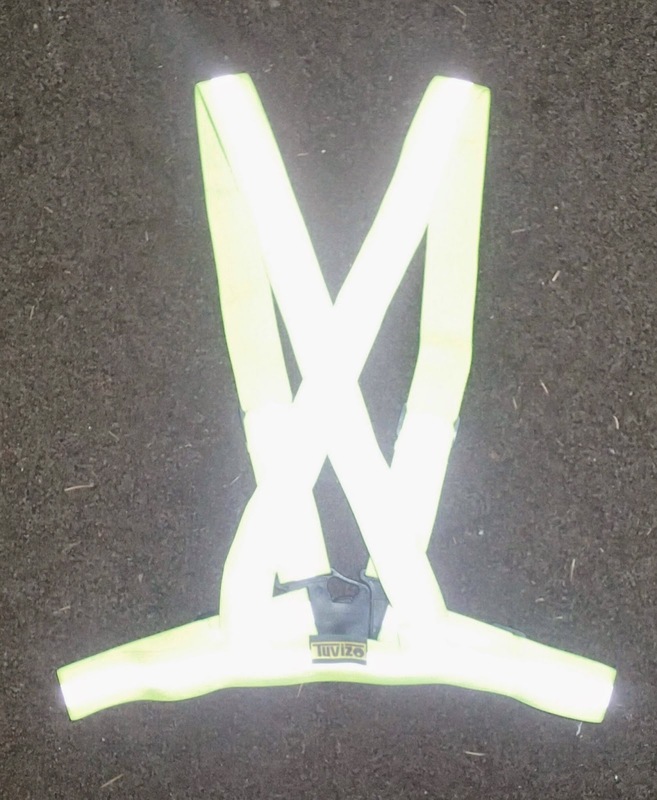 In daylight the vest is a bright yellow (it's also available in pink if that's more your style) with silver stripes. The silver stripes are highly reflective and do a fine job of reflecting back car headlights, streetlights and camera flashes. 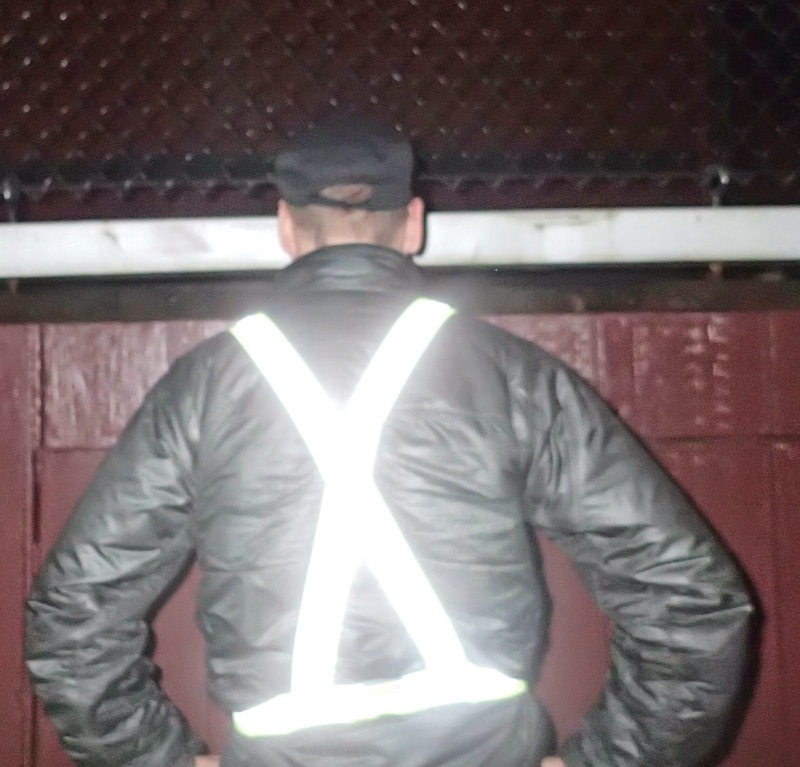 The Tuvizio Reflective Vest layers over whatever you happen to be wearing. I have the standard sized one which has a label reading S/M/L. 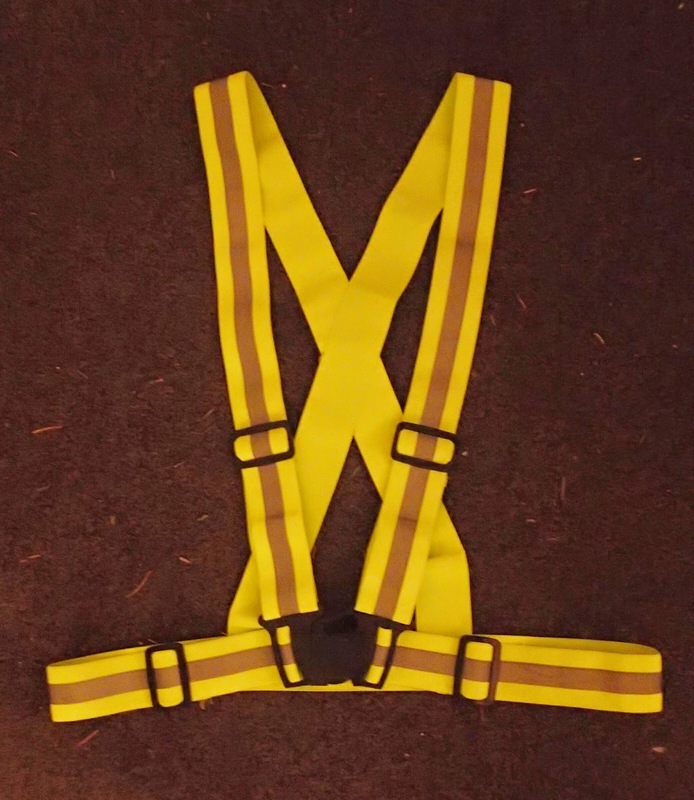 If you are very tall or round or plan on wearing the vest over a bulky jacket, you may wish to get the L/XL version. 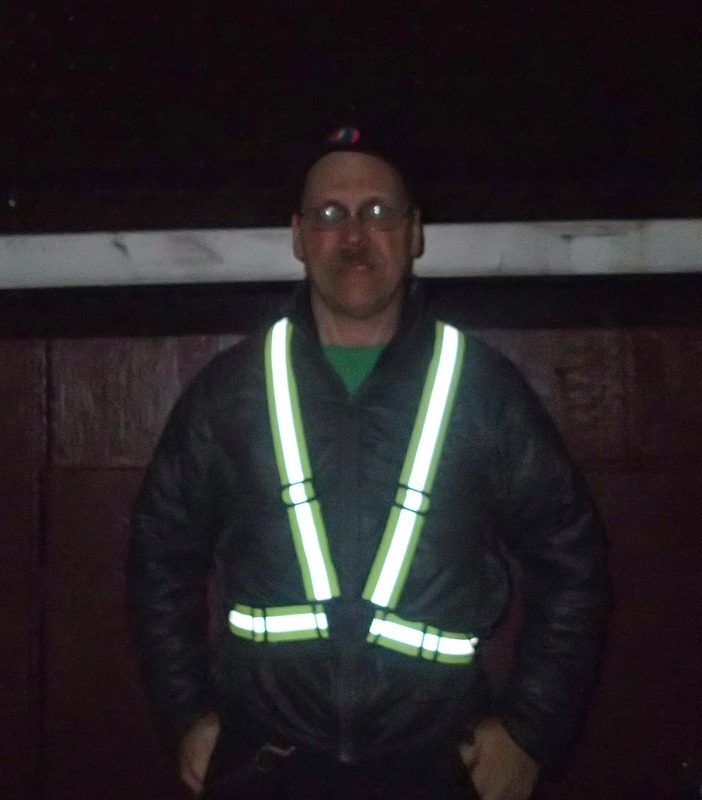 If you're out at night the Tuvizio Reflective Vest is a simple way to increase your visibility. It's well-made, comfortable, and effective. Inside on of Seattle's many coffee shops, waiting to catch the Bolt Bus to Portland. My days off are mid-week, and this week I spent much of Tuesday and part of Wednesday in Portland, Oregon. I brought my SwiftyONE scooter and camera with me. Like most of my adventures, this was done on a low budget but I had a lot of fun and I took a bunch of pictures. Swifty and the BoltBus in beautiful downtown Portland. The BoltBus is a quick (3 hour), inexpensive ($16 each way) to travel between Seattle and Portland. Swifty folds to a compact package that fits easily into the lower cargo compartments on the bus. Bolt is very accommodating to bikes, you don't have to box them up and there is enough space to handle loaded touring bikes. A friend of mine has even taken her cargo bike several times on the Bolt. I also had a working electrical outlet at my bus seat and a strong WiFi connection all the way to Portland and back. The BoltBus left Seattle at 8:00 AM and I was in downtown Portland by 11:00 AM. A small black scooter and BIG PINK office building. My friend Michael works in Big Pink, a gigantic office tower in downtown Portland. He took me to lunch at a place a few blocks away that had terrific tacos and we we caught up on various details of each other's lives. 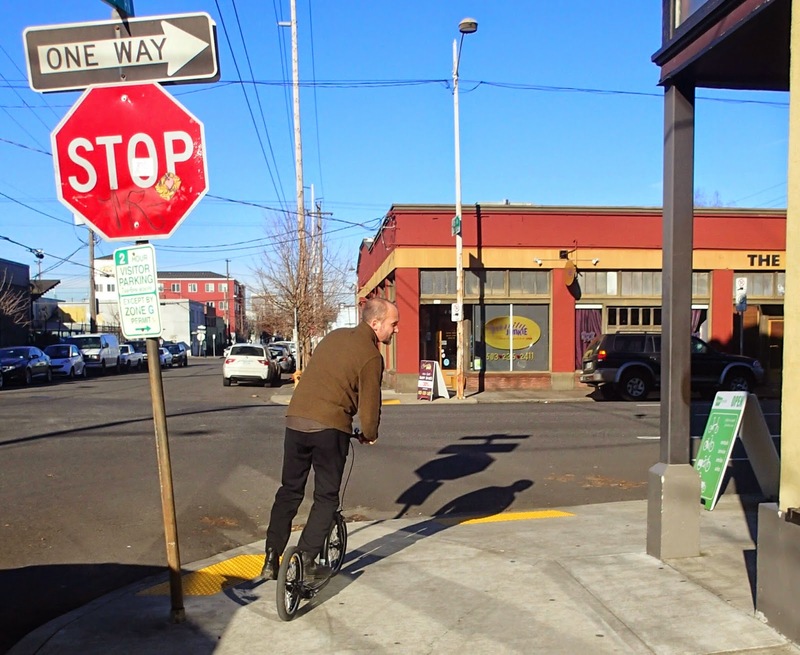 After Michael went back to work, I scootered across one of Portland's many bridges to go check out was was new at Clever Cycles. Along the way, I had a couple of different people spontaneously ask me about Swifty. And when I rolled into Clever Cycles, Todd said "I had a guy in here this morning asking what kinds of kick scooters we had here. I asked him if you'd sent him, but he claimed he didn't know you. I showed him the Nimble." This is the Nimble Cargo Scooter. I knew Todd had Nimble Cargo Scooters in stock at Clever, on of my goals on this trip was to test ride one. It took a little bit for me to get used to the linkage steering and the little, hard wheels are probably much better suited to warehouse floor than lumpy pavement but it was still fun to ride. It's a kind of bulky machine I don't need, but I can envision different kinds of workshops where it would come in handy. I'd told the folks at Swifty I'd take their scooter around to various shops that might be interested in carrying them in the US. Right now, the only way to get a Swifty in the US is to order it straight from Swifty in the UK, but it's a big leap of faith to order something you've never ridden. Right now, I'm kind of a Swifty evangelist spreading the good news of scootering to the new world. 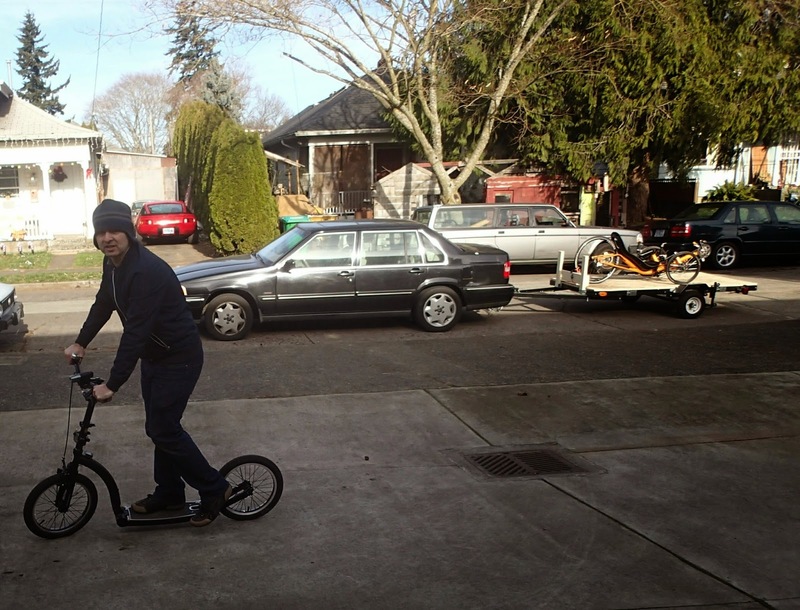 Todd appreciates the smooth ride you get from 16" pneumatic tires. Todd has something really cool to show me, a tiny electrical assist for a Brompton. I got to ride it and it is amazing. This is the motor and the drive wheel. The rectangular pouch is the battery. The little rotating knob is the throttle. There's also a tiny switch (not visible here) to activate the system. The battery is the single most visible change to the entire bike. The little motor is surprisingly peppy. This is still real new and if you want details, call up and talk to Todd but he told me the total weight of the system is 2.6 Kg (under 6 pounds). The capacity of the battery and the draw of the motor should give a range of nearly 40 miles on a charge. Price of the system will probably be around $1200 (on top of the cost of the Brompton). One of the windows at Clever is prismatic and the afternoon light makes the whole place kind of trippy. 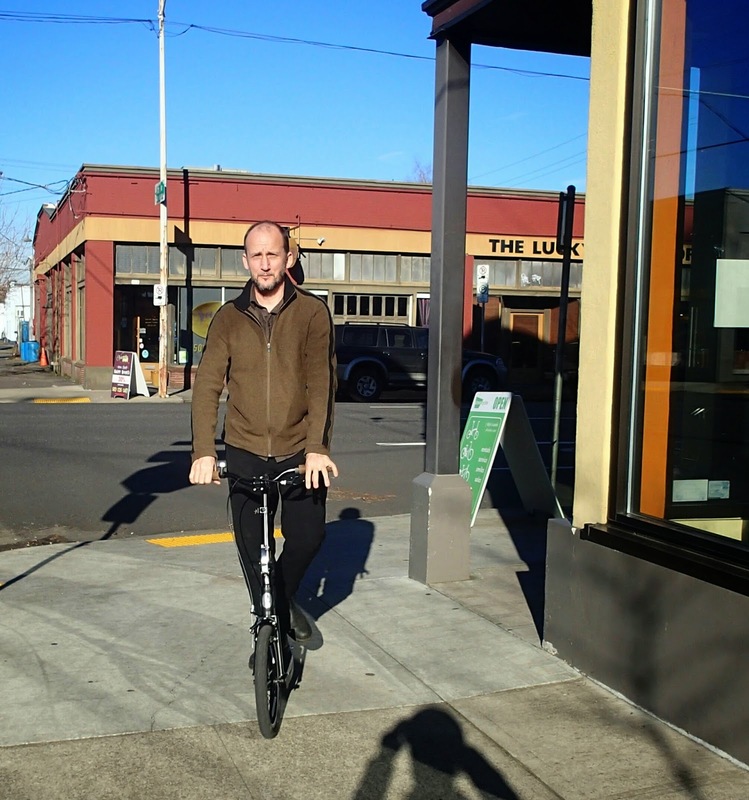 After my time at Clever I spend the rest of the sunny afternoon scootering along both sides of the river in Portland. The afternoon and evening light was lovely. I didn't see any of these. Maybe it was too late in the day or maybe it's just a summer thing. At 7:00 PM I worked my way back downtown to join the #NOKXL protest rally. This was one of hundreds of protests taking place against the extraction of tar sands oil and the building of the Keystone XL pipeline. I brought my own NO KXL sign but the protest organizers also provided the NO PIPELINE banners. 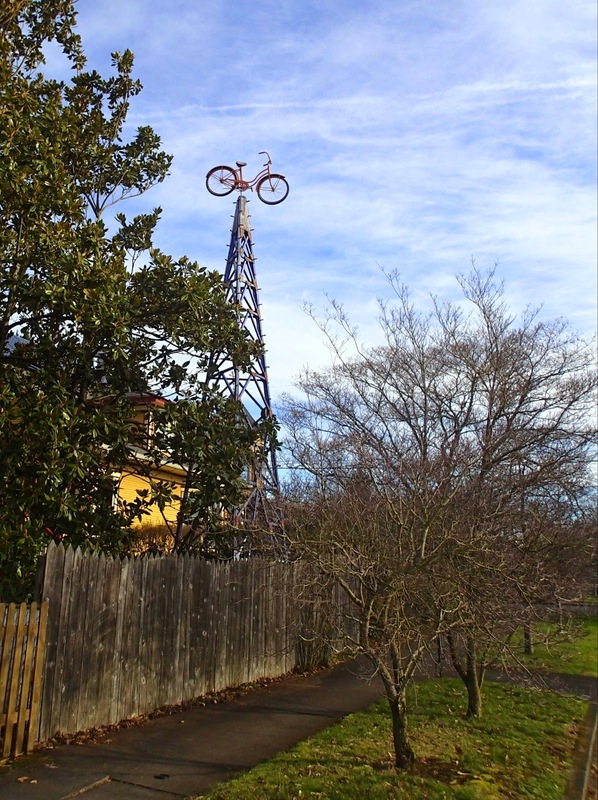 This was the niftiest bit of protest art, towed to the site by bike because this is Portland. Michael and I met back up at the rally. There was chanting and most of the cars going by were honking in support. There were probably around a hundred of us in the crowd. 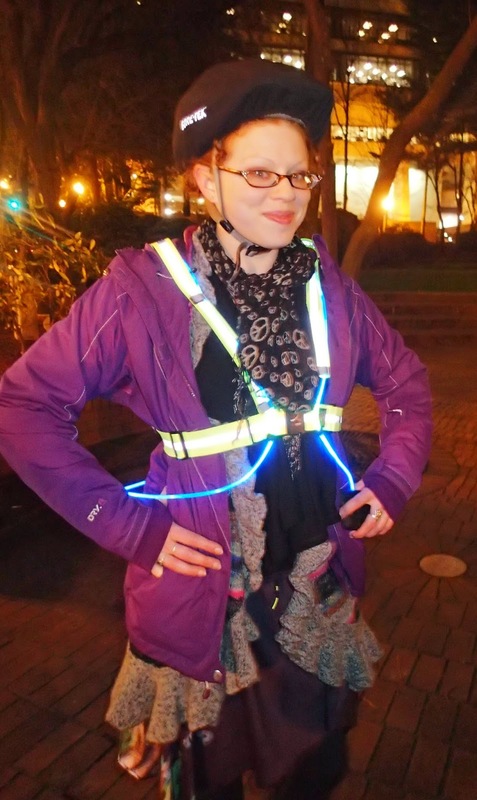 Michael and I got to talking with Jen because she had this really bright, glowing vest. 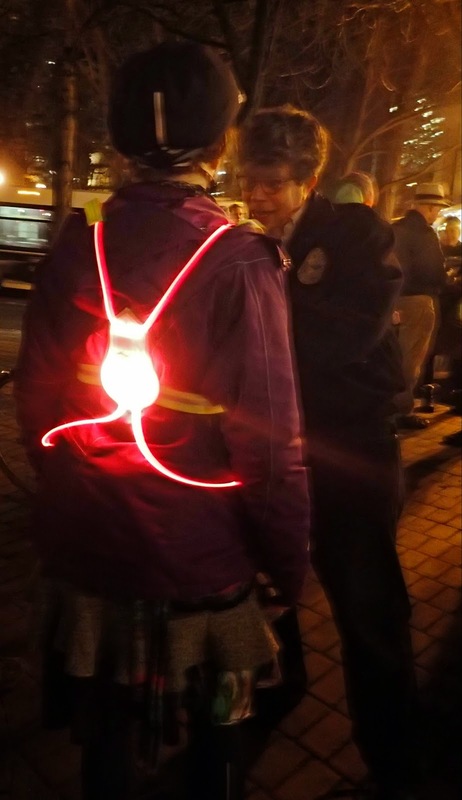 It's a NOX Tracer 360 Visibility Vest and it glows and pulses. After the rally Michael and I made our way over to Velo Cult. 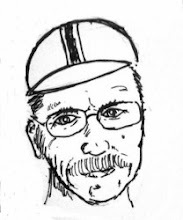 Velo Cult is both a bar and bike shop. This is Portland. Of course they have a bar that is also a bike shop or maybe it's a bike shop that is also a bar. By the way, if you want to learn more about Portland, I highly recommend a documentary series on IFC called Portlandia. Some people claim it's a comedy, but as near as I can tell, it's 100% true. Of course there's a bluegrass band playing tonight. Because this is Portland. Michael is a generous guy so I spent the night in his guest bedroom and in the morning I got a nice home-made breakfast and got to meet Michael's sister-in-law's dog. It's another pretty day in Portland and on my way to my next destination, I stopped by a Little Free Library. I love these things and Portland has a lot of them. Portland also has plenty of random art. This caught my eye. I had an appointment to check out Rose City Recumbents. In a few months they'll have a regular retail storefront, but for now they're working out a warehouse/shop space. 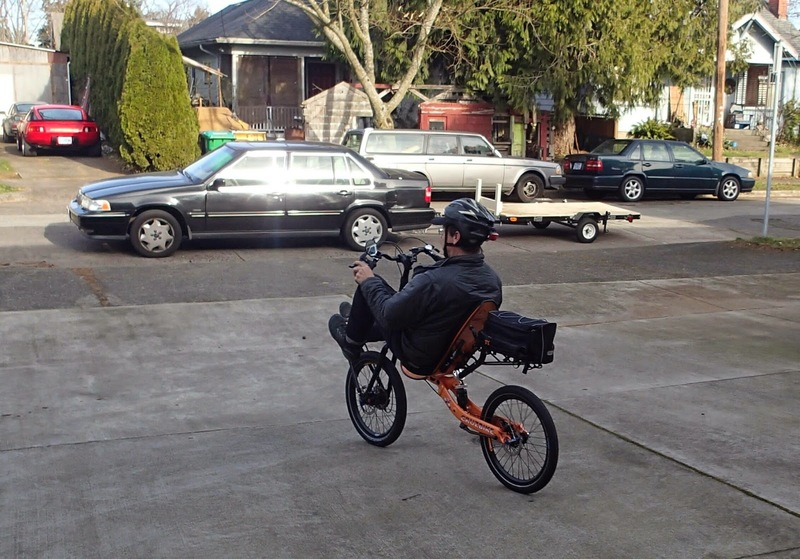 This is a CRUZBIKE Front-wheel drive recumbent. I'd ridden FWD years ago and was happy to learn I hadn't lost the skill. Jonathan checks out Swifty. I think we have a new scooter fan. After an hour of riding bikes, chatting about recumbents, trikes, the bike business, scooters and all kinds of other groovy things it was time for me to roll back toward downtown. Of course I went by another Little Free Library. I got a nice book of Ogden Nash poems from this one. In downtown Portland I folded up Swifty and got back on the Bolt Bus. 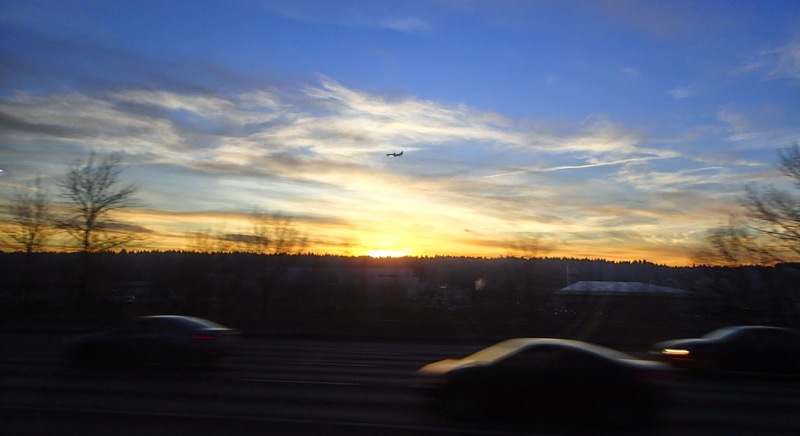 Three hours later, this was my view as we rolled into Seattle. And that, my friends, was my little mini-vacation to Portland, Oregon. I had a lot of fun and I'm sure I'll get back there again some time soon. No Driver's Licence, No Problem!